Does an anti-immigrant climate affect workers comp costs? – At Comp Time, Roberto Ceniceros discusses a recent news story in which Tom Hensley, president of Fieldale Farms Corp, testifies before the Georgia General Assembly about the detrimental impact that anti-immigration measures are having on his business. The impact included higher turnover and higher workers comp costs. Roberto is interested in hearing if anybody else has witnessed a similar trend of Latinos fleeing a state because of anti-immigrant sentiment and then claims trending upward – drop him anot if you have something to add. Can you hear me now? Musicians and other workers who are exposed to loud music in their workplace are typically given short shrift in the occupational safety and health literature. Recent studies at nightclubs show that all employees (waiters, bartenders, DJs, etc,) were exposed to noise levels above internationally recommended limits and were at a higher risk of early hearing loss and tinnitus. The NIOSH Science Blog discusses music-induced hearing loss. Shrinking employer appetite for RTW? 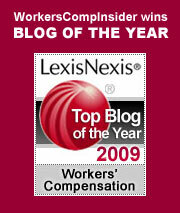 – Joe Paduda looks at how the economy may impact workers comp in 2012. Is higher severity in the offing? Joe talks about why that might be the case. What makes a good claims organization? – At PropertyCasualty360, Carl Van, president and CEO of the International Insurance Institute, Inc., has posted the first in a three-part series on The Five Standards of Great Claims Organizations. See how your organization or your vendor stacks up. Complex care – the folks at TMS continue to demonstrate that in complex care cases, the devil is in the details – and those details may be impeding an injured worker’s recovery and costing you money. See Pressure mapping: The underwear case for another example of how a small problem can become a big one. Jobs of yesteryear – Ptak Science Books features a series of photos of Pennsylvania Coal Boys on the job in 1895 excerpted from an issue of Scientific American. Japan – HR Web Cafe has posted various resources, including options for donations. The interactive before and after satellite images are very dramatic, giving some sense of scope.